What opportunities might come from a Ford sell-down? Might Mazda seek new partners? The relationship will not change. The media often report that if Ford reduces its share to 3 percent, Mazda cannot go it alone and would be compelled to find another partnership. That portrayal is rather disturbing. Mazda's sales in the United States this year have not quite kept pace with the overall U.S. market. The automaker's sales are up 9 percent to 174,770 vehicles through September, compared with the industry's 10 percent advance. But CEO Takashi Yamanouchi sees big growth around the corner. Over the next five years, he expects U.S. sales to double to 400,000 units. The Japanese carmaker is banking on new green-car technologies, referred to collectively as SkyActiv, that rely on efficient gasoline engines and weight-cutting engineering. 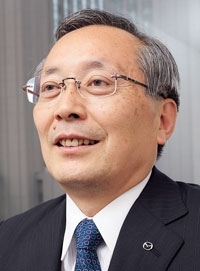 Yamanouchi says most models will have the fuel-saving features by 2015. They should help move the brand more upmarket and possibly command more premium pricing, he adds. In the meantime, Mazda is grappling with the yen's surge against the dollar and uncertainty about its longtime partner, Ford Motor Co., which is widely expected to further cut its holdings in Mazda. Ford's stake has dropped to 11 percent today from 33 percent in 2008. Yamanouchi, 65, spoke with Asia Editor Hans Greimel through an interpreter on Thursday, Oct. 21, about Mazda's latest technology, its future with Ford and his market outlook. What is your outlook for the U.S. auto market this year and next? We based our assumptions on third-party forecasts for a strong recovery to 12 million units annually. But recently, it is said getting to 12 million will be very difficult. Unless the industry grows significantly, we can't expect a major recovery in Mazda's sales volume, either. In April, we announced a midterm framework looking six years ahead. We now have global sales of 1.2 million units, and the outlook takes us to 1.7 million units. In the United States, we are looking to double the current level of 190,000 to 200,000 units to around 400,000. And the big assumption for that is that the U.S. industry recovers to the level of 17 million units that was achieved in 2000. So from 2012, we assume the U.S. industry will slowly return to the level of 17 million. What about your market share? If you just do simple arithmetic, we assume some improvement in market share. The reason is that by 2015, when the industry returns to around 17 million, if you look at the segmentation of the recovery, small passenger cars and crossovers will be driving the rebound. We have strong products in that segment currently, and in the future we will have full market changes incorporating our new SkyActiv technology. Sales of 400,000 is a big figure. But if the market comes back as we assume, then we think this is achievable with the technology we have. You plan to improve brand value and customer loyalty. How will that work in the United States? In the United States, we just kicked off the initiative. Activities will focus on enhancing the brand. Take pricing, for example. We are not just going to look at the competition and set competitive prices, like we did in the past. In addition, we will also pinpoint the segment's target customer to determine the appropriate price, and then pursue activities to win the customers' understanding for that pricing. If we can do that, then we can reduce incentives and improve residual value. Up to three years ago, we put our incentives at a level close to U.S. domestic brands. But right now, our incentives are low even among the big Japanese makers. Mazda wants to move its image upscale. How far do you want to take it? Generally speaking, we want to aim for the upper nonpremium segment. We'd like to gradually increase our positioning. It's not that coming out with one product will allow us to do this. Will the move allow you to command higher prices? If we include the SkyActiv technologies, we will have to decide based on the situation. We don't think technology alone will allow us to suddenly increase our prices. We need to define the customer. And then we need to align the mind-sets of our dealer network, our local people and how we conceive of our products. Otherwise, it will be difficult to achieve that kind of higher position or price. That means it will take more time. How do your new SkyActiv technologies play into this branding? When we have a product that incorporates the full SkyActiv technology, it will probably have fuel economy comparable to a hybrid vehicle. So whether we price at the same level as a hybrid or not is something that needs to be given careful consideration. It will provide us with huge opportunities. By 2016, about 80 percent of our products will incorporate SkyActiv products. We'll go through a full-model cycle for nearly our whole lineup by then. How is the yen's appreciation affecting Mazda, and what are you doing? It has a significant impact on Mazda. What we can do about it is continue building the brand and capturing as many opportunities in terms of sales volume and pricing. We also aim to achieve more efficient operations by reducing fixed and variable costs, leaving nothing sacred. There is no limit to this activity of eliminating waste. For example, we had set a global sales forecast for the current fiscal year at 1.27 million units, and we think that the full-year results will significantly overachieve this earlier forecast. The reason is that despite the strong yen, we are realizing opportunities to expand sales by improving the model mix and pricing. We don't have any one magic bullet. It's a combination of many small actions that accumulate. Your SkyActiv-G gasoline engine debuts next year in the United States. What product will get it? I'm not prepared to touch on that today. But from 2012 we'll have full implementation of the SkyActiv technologies in the United States and Japan, including engine, frame, chassis and transmission -- a 100-kilogram [220 pounds] reduction in weight. When will your hybrid technology land in the United States? We will be getting the core technology from Toyota and mating it to the SkyActiv-G engine. And we have said that we will develop it in Japan and introduce it first in Japan in 2013. Beyond that, we'll make a decision based on individual market conditions. Do you think hybrids will sell in the United States? I think right now they are only popular on the West and East coasts. But if we mate the SkyActiv-D diesel engine and automatic transmission with the Mazda6-class sedan, we can achieve 43 mpg under U.S. standards. Mileage of 43 mpg is better than many hybrids in the United States. And it's the same performance as the Mazda2. I can't say when we will introduce a hybrid to the United States, but we can offer products superior to hybrids before then. Ford is widely expected to cut its stake again in Mazda. What is the status of your relationship? In 2008 the relationship between Ford and Mazda changed from an equity affiliate to completely independent companies. But we also announced that the strategic relationship had not changed. And that state continues to this day. Last fall Mazda increased its capital base, so Ford's 13 percent stake was diluted to 11 percent. But the relationship between the two companies has not changed, and we continue to have meetings to find opportunities where both companies can cooperate. To what degree does Mazda's rollout of SkyActiv signal its independence? The media try to portray a change in the capital relationship as meaning the two car companies are going their separate ways. But four years ago, Mazda and Ford had talks where it was agreed Mazda would pursue SkyActiv, and Ford would pursue EcoBoost. So that's two years before November 2008, when Mazda was still an equity-based affiliate of Ford. Both companies were successful in developing their own technologies with the thought that there might be opportunities in the future to exchange and share. In what way are you continuing cooperation with Ford? We have formal meetings of senior management twice a year, and there are many submeetings that develop items for the agenda. R&d and product development items are the most common. For example, in our flexible-manufacturing area, we are able to achieve extremely lower capital investment than Ford. And Ford has come out many times to learn about what we're doing. We are also consulting them on our marketing activities. How can you optimize the use of your U.S. plant in Michigan to offset the higher yen? We produce the Mazda6 at Flat Rock, and the demand for that segment has shrunk dramatically. We were planning to build and sell 100,000 units of the Mazda6 in the United States. There were lots of customer inquiries, and the product was highly evaluated. But once the economic crisis hit, the segment shrank and our 100,000-unit plan was virtually halved, to about 50,000. We have to more effectively utilize the plant. Could you add a model there? It is a difficult decision because we have to consider the hollowing out of Japan, unless the concept is that we can produce incremental sales volume at Flat Rock. It is not that easy to put in a new product just because the yen is strong. It has to be considered in totality with the sales capability of the United States.